The iPad has become an inseparable companion for many of us: we use it in the office and at home, to work or to play, to create contents or to consume them. Who wants to use the Apple tablet all the day and on the move has more and more covers to choose from, but sometimes this is not enough: if you use an iPad really often, almost continuously, you want something different. This is what Marco Santini kept in mind when he created Padiglio, an innovative (and patented) iPad cover designed exactly to help those who use their tablet in an intensive and professional way. Marco has a mostly technical background, since he worked for telecommunications and system integration companies. Nothing to do with product design, you'd say, but Marco explains that this is not so true: "An analytic approach to tablet use, thinking about unconventional ways of using an iPad, looking for the best possibile solution… These are all parts of my training which were very useful in creating Padiglio". From an analysis of how the iPad is normally used Marco got the idea of a versatile cover which can be used as an agenda, an handbag, even a holster. 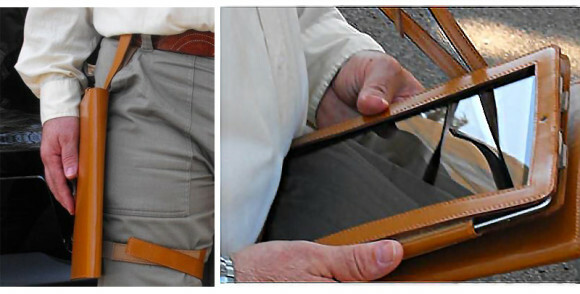 Padiglio is designed for those who are always using their iPad in some way. "Too often - says Marco - you can only hold it in your hands or place it somewhere. But so it could fall, or you can forget it, or it can be stolen". One of the nice things of Padiglio: it's made in italian leather. That's why Padiglio stands out in a market populated by covers made in plastic or in other materials which are maybe 'technological' but not always pleasant to look at and to handle. Of course Padiglio is made in eco-friendly leather: "It's a matter of cost - says Marco - but not only that. First prototypes were actually made in real leather, but then I was told about something called 'fleshing machine'… so I decided to switch to eco-friendly leather". Now that Padiglio is on sale, Marco already defined its next development steps. "Padiglio is our flagship product and the one we're investing on, but we're already working on how it can fit iPad Air and Sansung or Nexus tablets. We have also started to patent a new iPad accessory to take photos and movies with a tablet while you're walking, without stumbling. Of course you'll need a Padiglio to use it at its best, and also a specific App. A friend of mine is working on the iOS version, I'm committed to the Android one". You can find other details on Padiglio visiting its Store on MakeTank.